Neal and I (Debbie) enjoyed the many activities of the Potato Festival held in Monte Vista at Fullenwider Park on Main Street on Saturday, September 10, 2011 from 8:00 a.m. to 4:00 p.m. 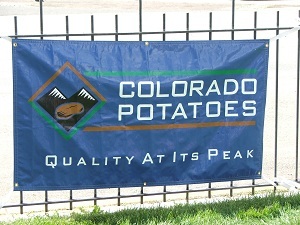 The Potato Festival is free to the public. There was a full day of activities for every age person to enjoy. The day began for us at 8:30 a.m. when we loaded a very comfortable tour bus which the Colorado Potato Administrative Committee (CPAC) had hired to come from Denver. 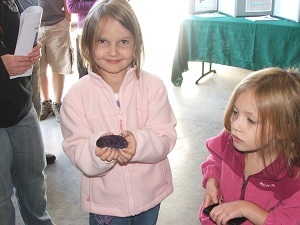 There was no cost to go on the bus tour, just RSVP to the CPAC office prior to the Potato Festival at 719 852-3322. We enjoyed the bus tour narrated by the Executive Director of the CPAC office, Jim Ehrlich. He had a vast amount of information regarding potatoes grown in the San Luis Valley. The CPAC receives five cents for each 100 pounds of potatoes that are shipped out of the Valley for advertising and research. 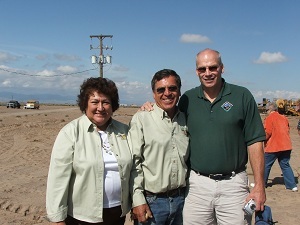 Our first stop of the morning was to the Colorado Extension Research Center located nine miles north of Monte Vista. Here we heard from several gentlemen who work for the Research Center. 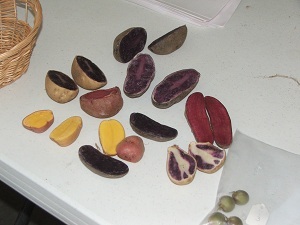 The San Luis Valley grows about 20 varieties of potatoes. 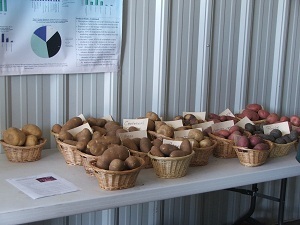 The Research Center raises 100-130 varieties of potatoes and is constantly working on new varieties, disease control, insect control, water consumption and other any elements involved in the growing process. 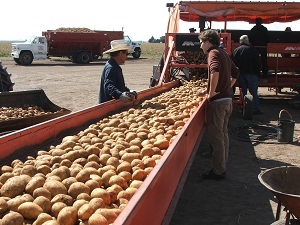 There are approximately 55,000 acres of potatoes grown in the San Luis Valley and it has the second largest fresh market. 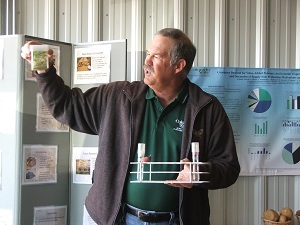 Approximately 23,000 employees are hired annually to help with the agriculture in the Valley. The San Luis Valley has ideal growing conditions for potatoes which is a high of usually no more than 91 degrees and a low of 50 degrees. 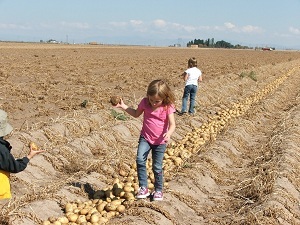 The growing season for potatoes is very short in the Valley, usually about 90 days. Our second stop on the bus tour was to Martinez Farms. This is a family who we know personally and have been farming in the San Luis Valley for a number of years. Mr. Martinez is originally from Peru where the first potato was grown. We were able to watch a digger as it dug the potatoes from under the ground and set them in a row. This is followed by the harvester which then comes down the row picking up the dug potatoes and also digs two rows of potatoes. 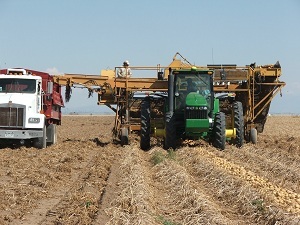 These potatoes are loaded in a truck which drives alongside the harvester. 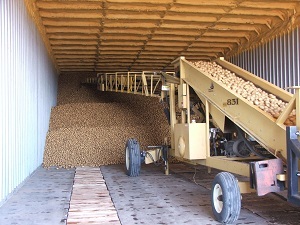 When the truck is full of potatoes, the load is taken to a cellar where the potatoes are unloaded on to conveyor belts and stacked into a cellar to be stored until they are ready to sell. Martinez Farms understands the necessity of caring for their crops and the soil necessary for growing, taking every precaution to ensure successful farming practices. We then ended the tour back in Monte Vista at Fullenwider Park, but there were other activities going on. A real highlight of the Potato Festival is the potato cook-off. 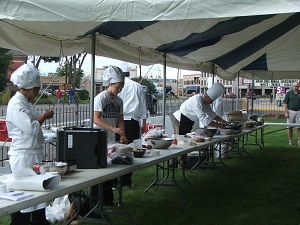 Five Professional Chefs from the Denver area compete from 11:30 a.m. to 2:30 p.m. with a panel of judges and audience participating in the sampling of the prepared potato dishes. Free baked potatoes were served with toppings throughout the day. Activities included a mashed potato dunk tank, a kids carnival, free potato games including a mashed potato war, potato peeling, potato sack races, hot potato, a potato decorating contest, and a hidden prize in a pool of mashed potatoes. There were many craft and food booths surrounding the park throughout the day. Downtown merchants also provided a potato tasting contest. Participants started at the Monte Vista Chamber of Commerce picking up a list of merchants who provided a potato dish for sampling. Participants were asked to vote for their top potato dish. There were eight businesses participating in the potato tasting which included chili cheese fries, potato bread, potato carrot cake, potato brownie, and chocolate covered peppermint patties to name a few. At 4:00 p.m. activities moved west to Chapman Park where a potato sling shot competition was to take place followed by live music. 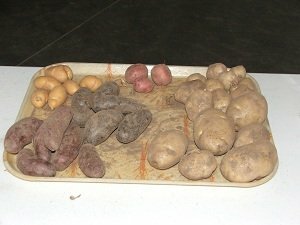 I think the Potato Festival is a wonderful event which everyone, whether a visitor to the Valley or a native to the Valley, should participate in. This was a very informative and fun filled day and I certainly encourage everyone to come next year.